A banked turn (or banking turn) is a turn or change of direction in which the vehicle banks or inclines, usually towards the inside of the turn. For a road or railroad this is usually due to the roadbed having a transverse down-slope towards the inside of the curve. The bank angle is the angle at which the vehicle is inclined about its longitudinal axis with respect to the horizontal. Note that μ can be the coefficient for static or dynamic friction. In the latter case, where the vehicle is skidding around a bend, the friction is at its limit and the inequalities becomes equations. This also ignores effects such as downforce which can increase the normal force and cornering speed. Upper panel: Ball on a banked circular track moving with constant speed v; Lower panel: Forces on the ball. The resultant or net force on the ball found by vector addition of the normal force exerted by the road and vertical force due to gravity must equal the required force for centripetal acceleration dictated by the need to travel a circular path. This provides the velocity that in the absence of friction and with a given angle of incline and radius of curvature, will ensure that the vehicle will remain in its designated path. The magnitude of this velocity is also known as the "rated speed" (or "balancing speed" for railroads) of a turn or curve. Notice that the rated speed of the curve is the same for all massive objects, and a curve that is not inclined will have a rated speed of 0. The difference in the latter analysis comes when considering the direction of friction for the minimum velocity of the automobile (towards the outside of the circle). Consequently, opposite operations are performed when inserting friction into equations for forces in the centripetal and vertical directions. Improperly banked road curves increase the risk of run-off-road and head-on crashes. A 2% deficiency in superelevation (say, 4% superelevation on a curve that should have 6%) can be expected to increase crash frequency by 6%, and a 5% deficiency will increase it by 15%. Up until now, highway engineers have been without efficient tools to identify improperly banked curves and to design relevant mitigating road actions. A modern profilograph can provide data of both road curvature and cross slope (angle of incline). A practical demonstration of how to evaluate improperly banked turns was developed in the EU Roadex III project. See the linked referenced document below. 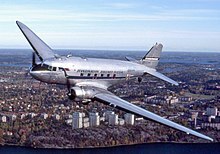 Douglas DC-3 banking to make a left turn. When a fixed-wing aircraft is making a turn (changing its direction) the aircraft must roll to a banked position so that its wings are angled towards the desired direction of the turn. When the turn has been completed the aircraft must roll back to the wings-level position in order to resume straight flight. When any moving vehicle is making a turn, it is necessary for the forces acting on the vehicle to add up to a net inward force, to cause centripetal acceleration. In the case of an aircraft making a turn, the force causing centripetal acceleration is the horizontal component of the lift acting on the aircraft. In straight, level flight, the lift acting on the aircraft acts vertically upwards to counteract the weight of the aircraft which acts downwards. During a balanced turn where the angle of bank is θ the lift acts at an angle θ away from the vertical. It is useful to resolve the lift into a vertical component and a horizontal component. If the aircraft is to continue in level flight (i.e. at constant altitude), the vertical component must continue to equal the weight of the aircraft and so the pilot must pull back on the stick a little more. The total (now angled) lift is greater than the weight of the aircraft so the vertical component can equal the weight. The horizontal component is unbalanced, and is thus the net force causing the aircraft to accelerate inward and execute the turn. Vector diagram showing lift, weight and centripetal force acting on a fixed-wing aircraft during a banked turn. where g is the gravitational field strength. This formula shows that the radius of turn is proportional to the square of the aircraft’s true airspeed. With a higher airspeed the radius of turn is larger, and with a lower airspeed the radius is smaller. This formula also shows that the radius of turn decreases with the angle of bank. With a higher angle of bank the radius of turn is smaller, and with a lower angle of bank the radius is greater. In a banked turn at constant altitude, the load factor is equal to 1/cosθ. We can see that the load factor in straight and level flight is 1, since cos(0) = 1, and to generate sufficient lift to maintain constant altitude, the load factor must approach infinity as the bank angle approaches 90° and cosθ approaches zero. This is physically impossible, because structural limitations of the aircraft or physical endurance of the occupants will be exceeded well before then. ^ Beer, Ferdinand P.; Johnston, E. Russell (July 11, 2003). Vector Mechanics for Engineers: Dynamics. Science/Engineering/Math (7 ed.). McGraw-Hill. ISBN 978-0-07-293079-5. ^ Federal Aviation Administration (2007). Pilot's Encyclopedia of Aeronautical Knowledge. Oklahoma City OK: Skyhorse Publishing Inc. Figure 3–21. ISBN 1-60239-034-7. Serway, Raymond. Physics for Scientists and Engineers. Cengage Learning, 2010. Health and Safety Issues, the EU Roadex III project on health and safety issues raised by poorly maintained road networks.